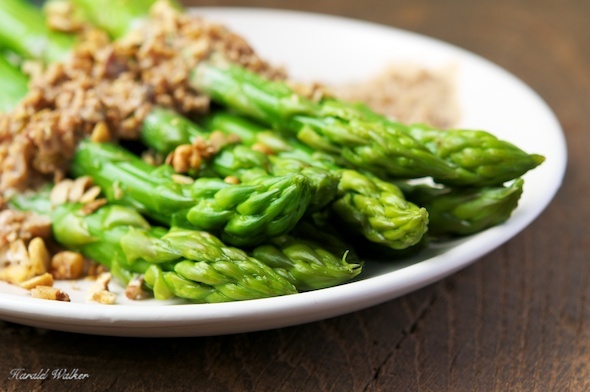 What a tasty combination this is: asparagus with walnuts. This makes a very elegant side dish. Cut the woody ends of the asparagus off. Bring a pot or large pan of lightly salted water to boil. Meanwhile, chop the walnuts finely. In a small sauce pan, heat the oil of choice. Add the walnuts and lightly toast. When the walnuts begin to release their aroma, remove 1-2 tablespoons full to use as garnish. Turn the heat to low, and add the soy cream and soy sauce or tamari. We lightly pureed the mixture using a staff or immersion blender. We only lightly pureed, as we wanted a grainy, nutty mixture, not a smooth puree. Taste and season accordingly with salt and white pepper. If the sauce is too thick, you can add a bit of water or more soy cream. When the asparagus are cooked, drain and place on a serving platter. Pour the walnut sauce on top and sprinkle the remaining walnuts as a garnish. Cooking the asparagus with a 1/2 teaspoon of baking soda will help keep the bright green color and will not flavor the asparagus. Posted by Chris Walker on April 13, 2012 in Asparagus, Side Dishes, Walnut.